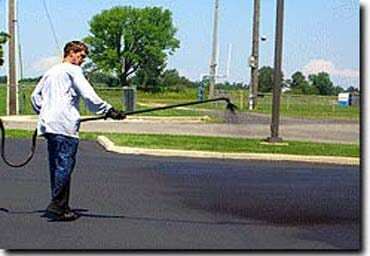 Sealcoating is the method of protecting your asphalt pavement by applying a coating to the pavement surface. Oftentimes homeowners try to do this themselves, but hiring a pavement maintenance professional will give you better results. The professional contractor understands pavement, knows how the sealer works, and is trained to help stop small problems before they become big, expensive problems. He knows the proper techniques to prepare the pavement and apply sealer, he owns and knows how to use the necessary tools, and he also uses a top-quality professional sealing product. He can also include aggregate in his sealcoat, which will make the sealer last longer and assure an abrasive surface for car and foot traffic. 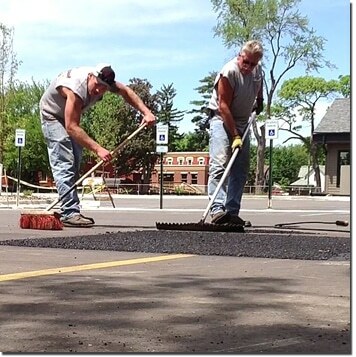 Without aggregate, a sealed asphalt surface can be slick. Preceded by effective crack repair, sealcoating applied every two or three years can significantly extend the life of your driveway/parking lot for minimal cost. Asphalt pavement begins to deteriorate almost as soon as it’s placed. As the pavement is exposed to oxygen, the asphalt binder (tar) hardens. This hardening results in a brittle surface that will eventually crack. The cracks enable oxygen and rainwater to penetrate the pavement, often into the subbase, weakening it and reducing pavement strength. Sealcoating protects the surface and fills surface voids, reducing the pavement’s exposure to oxygen and water, and extending pavement life. These rays from the sun also cause the pavement to deteriorate. They break down the links between carbon bonds in the asphalt, causing the pavement to crumble. Regularly applied sealcoats prevent ulraviolet rays from penetrating the pavement. This is especially important on driveways/parking lots where cars are often parked or worked on. Gasoline or oil will soften asphalt concrete. Coal tar sealers aren’t soluble in gas or oil so they prevent damage caused by leaks or spills. Asphalt sealers, which normally would be soluble in gas or water, usually include additives that enable them to resist such leaks. By filling surface voids, sealcoating also reduces the depth to which oil or gas can penetrate the pavement. Sealcoating brings back the dark black color of the original pavement, making it look and wear like new. Sealcoated pavements also are easier to clean and maintain. Because sealcoats fill the surface voids, they make the surface much smoother. A smoother surface is easier to sweep, shovel and wash. But wait at least 90 days. Asphalt concrete needs between 60 to 90 days to fully cure, and contractors should wait that long before sealcoating. If sealer is applied before the pavement is cured, the oils in the asphalt will work their way to the surface and the sealer won’t adhere properly. Two coats of sealer are recommended-the added cost is minimal compared to the extra protection. Rely on your pavement maintenance contractors to make this decision. 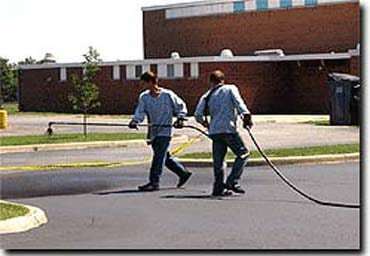 They know what type of sealer is best for your pavement condition and region of the country. Most likely they will recommend one of two types of sealer. The main ingredient in this sealer is a by-product of the oil-refining process. It is naturally compatible with the asphalt concrete, but by nature it is less resistant to oil and gasoline spills. Manufacturers of asphalt sealers modify the asphalt emulsion with special additives that make it more resistant to gasoline and oil spills. Coal tar is a by-product of the steel manufacturing process. After it has been refined, it is used as a sealer for both pavements and roofs. 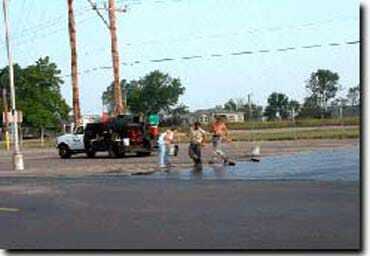 Coal tar emulsion is naturally resistant to oil and gasoline spills. THIS PRODUCT IS THE MOST RECOMMENDED FOR THIS REGION. Contains additives that will speed drying, reduce tracking, improve adhesion to the pavement surface, gives sealer elasticity, suspends sand for uniform distribution on pavement, and generally extends the wearability and life of the sealcoat. Will have the proper aggregate (sand) content to provide an abrasive surface for slip resistance and surface glare. Your driveway/parking lot is a significant investment in your property. Proper maintenance by a skilled professional can help make your investment last more than twice as long as unmaintained pavement, thereby extending the life of the pavement and saving your money over the long run. Your pavement maintenance contractor is trained in detection and repairing pavement defects ranging from base failure to crack repair and sealcoating. He has the right tools, the knowledge, and the know-how to do the job right. Rely on him to help you to maintain a long-lasting, quality pavement.